I also sat in the General Assembly as Israel’s Prime Minister Benjamin Netanyahu offered to begin negotiations with Abbas, with absolutely no preconditions, in New York, at the United Nations, that very day. He said he would come to Ramallah to negotiate with him or keep the door of his Jerusalem office open. He did not even require as a precondition to negotiations that the Palestinians acknowledge what the UN recognized in 1947—namely, that Israel is the nation-state of the Jewish people. Do the Palestinians really want statehood??? Or do they really want something else??? Were Palestinian statehood Abbas’s real goal, after all, he could have delivered it to his people three years ago. In 2008, then-Israeli Prime Minister Ehud Olmert proposed the creation of a sovereign Palestinian state on territory equal (after land swaps) to 100 percent of the West Bank and Gaza, with free passage between the two plus a capital in the Arab section of Jerusalem. Yet Abbas turned down the Israeli offer. And he has refused ever since even to engage in negotiations. It is no mystery, however. The raison d’être of the Palestinian movement has never been the establishment and building-up of a sovereign Palestinian homeland. It has always been the negation of a sovereign Jewish homeland. That is why well-intended proposals for a “two-state solution’’ have never come to fruition, no matter how earnestly proposed by US presidents or UN secretaries-general. And that is why Abbas and other Palestinian leaders insist that a Palestinian state would be explicitly Arab and Muslim, but adamantly refuse to acknowledge that Israel is legitimately the Jewish state. With its disdain for Israel, the U.N. has invalidated itself as a forum in which to try to heal the Arab-Israeli conflict. Israel isn't just condemned by the world body more than any other country; the Jewish state is condemned more often than all other countries combined. According to U.N. Watch in Geneva, the U.N.'s Human Rights Council has adopted, since its founding in 2006, about 70 resolutions condemning specific countries, 40 of which have been against Israel. In the General Assembly, about 20 anti-Israel resolutions are adopted each year, as opposed to five or six against other countries. That is not mere hostility but pathological obsession. The vote to recognize Palestine will almost certainly increase anti-Israel violence in the region. It will also likely encourage the international boycott-Israel movement, which uniquely ostracizes the Jewish state. Palestinian Authority leader Mahmoud Abbas has said that upgraded Palestinian status at the U.N. would "pave the way" to press for legal sanctions against Israel. The likely result would be to turn any Israeli act of war, even in self-defense, into a war crime. Statehood is a responsibility to be earned. And so far the Palestinian national movement has hardly proved its willingness to live in peace beside Israel. Palestinian schools and media — those of Fatah as well as of Hamas — routinely portray Israel as an artificial and temporary creation, without any rootedness in the land. All of Jewish history — from the ancient temple in Jerusalem to the Holocaust — is dismissed as a lie. No Palestinian leader has told his people — as Israeli prime ministers since Yitzhak Rabin have told their people — that the land must be shared by two nations. Instead, Palestinian leaders have consistently told their people that the goal is a state on all the land between the Jordan River and the Mediterranean Sea, and they encourage their people to dream of a Middle East without Israel. The U.N. vote comes at a time when Israelis are feeling increasingly besieged. In the last year, Israel's closest regional ally, Turkey, has turned outright hostile; Turkey's Islamist prime minister, Recep Tayyip Erdogan, last week threatened to dispatch warships against Israel. The peace with Egypt is unraveling: Two weeks ago, as a mob ransacked Israel's embassy in Cairo, Egyptian leaders refused to take desperate calls from their Israeli counterparts and dispatched commandos to rescue Israeli personnel only after American intervention. Israel evacuated its embassy in Amman, Jordan, over the weekend to avert a similar situation. Meanwhile, terrorist enclaves on Israel's borders — Hezbollah in the north, Hamas in the south — aim tens of thousands of missiles at Israeli cities. And the Iranian regime, whose declared goal is the destruction of Israel, is moving ever closer to nuclear capability. 9/11 was a huge wake-up call for many of us. It was important to finally understand the Islamist threat, and in the 10 years following 9/11, the west has made significant progress; we removed the Taliban from power in Afghanistan; al-Qaida has been largely disabled; Saddam Hussein was deposed; and an Arab spring has emerged. The west was provoked and the west reacted. Unfortunately, everybody seems to be tiring. In fact, the Americans seem to be fast asleep - paralyzed with interminable budget problems and an administration that seems to have no interest in promoting democracy overseas. The U.S. networks now run non-stop shows about financial problems - personal, city, state and federal. Tune in tonight for the latest batch of bad financial news; more awful news at 11. The fight to raise the debt ceiling was farcical. And, if you think the Americans are bad, well, does anybody really believe the Europeans are facing up to their financial problems? But what really keeps me up at night is the new tone of isolationism. You can see it in the Republican candidates for the Presidency - they don't talk at all about Islamist terrorism; they all can't wait to get out of Afghanistan; and promoting democracy seems like a quaint notion of foregone years. To these candidates, foreign policy is a useless abstraction - unless it's a plan to cut aid or other related spending. I worry that some of this "budget-cutting-isolationism" will find its way into the conservative discussion in Canada. And that would be unfortunate. When I last wrote for canada.com, I said that Canada has a great opportunity to engage with the world and that Canada's time had come. Libya is a good case study. We played a major role in combat operations, and we were one of the first governments to recognize the rebel council. Canada was more engaged than the U.S. - from start to finish. But there are some problematic signals. We've already seen cuts in aid to the Afghan people. I'm afraid that in our rush to balance our budget, we will cut out foreign aid and the military because it is easy - and it really won't affect us in our daily lives. I certainly think we can save money - we can find alternative methods of aid delivery - spending money where it counts rather than on bullet-proof vests for aid workers living in air-conditioned suites. But, shouldn't we also have the capability to do more? This is our time to step up to the plate. Forget about the Americans. Forget about the Europeans. As the old, decrepit regimes are overthrown, wouldn't it make sense that people know that Canada was there to help? What an opportunity to build good will! And, will our move to balance the budget dictate the need to cosy up to the Chinese - our version of "raising revenues." John Baird's last trip to China was educational - human rights was a definite afterthought, no? So, yes we should balance our budgets. But let's build in room to do some good around the world. And let's not forget that our troops will be needed again. I don't know where or when. All I do know is that they WILL be needed again. In July of 2004, members of the National Commission established to look into the September 11 attacks were facing immense pressure. The target date for submitting the report the whole of America was waiting for had passed, and commission members were given a 60-day extension that was also about to expire. However, eight days before the final submission date, some commission members received word of new information; a real intelligence time bomb. Commission members didn’t know what to do. On one hand, a whole new lead emerged; yet on the other hand, nobody could process this huge amount of information within days. At the end of the day, the commission chose a solution that turned out to be the worst of all: It crammed some of the information into three pages (pp. 240-242 in the report) written hectically, ignored most of the information, and in fact left the big question open. As it turned out, the prominent building housing the National Security Agency’s headquarters in Fort Meade includes a particularly interesting room. In this room, the NSA accumulated tens of thousands of conversation records pertaining to one subject: The ties between Iran’s intelligence service and al-Qaeda from the 1990s to the eve of the 9/11 attacks. The piles of information included 75 intelligence documents characterized as critical to understanding the relationship between Tehran and al-Qaeda. At the end of the day, the commission noted in its report that the issue deserves further scrutiny by the US Administration. However, such examination was not undertaken and may have never materialized. Indeed, this entire affair may have remained buried in the three abovementioned pages, had it not been for one brave woman: Ellen Saracini. Saracini is not an intelligence analyst or counter-terrorism expert. She is the widow of pilot victor Saracini, the captain of the Boeing jet that took off from Boston aboard United flight 175, which was crashed into the southern tower. However, Ellen was unwilling to see the death of her husband and father of her two daughters end with yet another line in the commission’s report; she decided to seek justice on her own. The investigation kept progressing, diving deep into the dark corners of the global world of intelligence and terrorism. Ten years later, Mellon and his team are convinced that they possess the “smoking gun” that will tie Iran to the September 11 attacks. The legal team drafted a huge lawsuit, recently submitted to the Manhattan District Court. What hides inside it is far from being routine. The lawsuit is premised on a dramatic charge: The responsibility for the 9/11 attacks lies not only with al-Qaeda, but also with Iran and Hezbollah, based on what attorneys say is clear, unequivocal evidence. The case has far-reaching implications, which explain why the US government is not eager to look into the conversation records in the abovementioned NSA room. A ruling that Iran is linked to the attacks would pose a tough test to Administration officials: On the one hand, they would not be able to ignore such verdict. Yet on the other hand, what exactly will they do with it? Will they attack Iran, just as they invaded Afghanistan and Iraq? Please join us for the launch of Salim Mansur's new book: "Delectable Lie: A liberal repudiation of multiculturalism". Professor Mansur will be on hand to speak about this book, we will have copies of his book for sale as well. Following his speech, we will also have a panel discussion with David Solway, David Harris and others. Tickets for Salim Mansur's book launch are now available at Compact Music (190 Bank, 785 Bank), and Collected Works (1242 Wellington). Salim Mansur is an Associate Professor in the faculty of social sciences, University of Western Ontario, London, and teaches in the department of political science. He is the author of Delectable Lie: a liberal repudiation of multiculturalism (2011), Islam’s Predicament: Perspectives of a Dissident Muslim (2009) and co-editor of The Indira-Rajiv Years: the Indian Economy and Polity 1966-1991 (1994), and has published widely in academic journals such as Jerusalem Quarterly, The Journal of South Asian and Middle Eastern Studies, American Journal of Islamic Social Sciences, Arab Studies Quarterly, and Middle East Quarterly. Mansur writes a weekly column for Toronto Sun and his Sun columns are published across Canada in newspapers owned by the Sun Media. He wrote a monthly column for the magazine Western Standard (Calgary), and periodically for National Post (Canada), and has published in the Globe and Mail (Toronto), the National Review Online and FrontPageMagazine.com and has also written for the PajamasMedia.com in the United States. Mansur was born in Calcutta, India and moved to Canada where he completed his studies receiving a doctorate in political science from the University of Toronto. Before joining the University of Western Ontario he worked as a Research Fellow at the Canadian Institute for International Peace and Security in Ottawa. Mansur is a member of the Board of Directors of Center for Islamic Pluralism located in Washington, D.C., an academic consultant with the Center for Security Policy also based in Washington, D.C., Member of the Advisory Board for the Centre for Immigration Policy Reform, and Vice President for Canadians Against Suicide-Bombing. Mansur remains active in public affairs, is a frequent analyst and commentator on radio and television, invited as a panelist in PBS Jim Lehrer Hour and has participated in the Doha Debates held in Doha, Qatar, broadcast on the BBC World Forum from London, England. Mansur was presented in September 2006 with the American Jewish Congress’s Stephen S. Wise “Profiles in Courage” award. 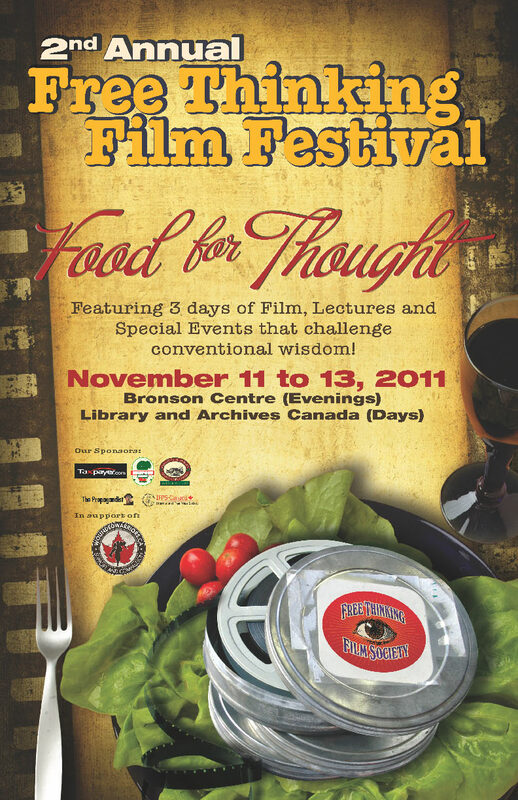 On November 11th, 2011, The Free Thinking Film Society kicks off its 2nd annual film festival to celebrate liberty, freedom and democracy. The Free Thinking Film Festival will feature three major events, two panel discussion and over 20 films, between November 11-13, 2011 at Library and Archives Canada and the Bronson Centre. There will also be a Free Thinking Alley where attendees can buy books and DVDs, and enjoy food and drink. The Festival opens at 6:30 PM November 11th with History Wars, a debate between Jack Granatstein (Historian and former director of the Canadian War Museum) and Michael Byers (Professor of Political Science at UBC) on the future of the Canadian military, moderated by Michael Bliss. This event is co-sponsored by the Macdonald-Laurier Institute and will take place at the Bronson Centre. The Festival will end with “Unmasked: Judeophobia and the Threat to Civilization”, the Canadian premiere of a documentary about the current political assault against Israel. Producer Gloria Greenfield will be in attendance. Other films include “Angryphone,” about English language rights in Quebec; “The Biases of the CBC,” a film and panel discussion on CBC bias against Israel and conservatives; “The Power of the Powerless,” a look at the velvet revolution that toppled communism in Czechoslovakia; “The Living,” a film about the Ukrainian famine of the 1930s; “Freedom of What?cott,” a documentary about free speech in Saskatchewan; “Freedom Fighter,” Rev. Majed El Shafie’s campaign against discrimination against religious minorities around the world; “The 10 Conditions of Love,” about Rubiya Kadeer, the leader of the Uyghur people and their fight to save their culture; “Cool It,” why we should ‘cool it’ when it comes to global warming; “3 Billion and Counting,” tells us why we need DDT to fight malaria in Africa; and many, many other films. Free Thinking Film Society show films that promote limited government, free market economies, and the dignity of the individual, and a healthy respect for Western culture. The Taliban are only interested in violence...here's Terry's take on those that want to negotiate with the Taliban. I’d like to be open-minded about this, but if I am going to be told to believe in faeries, the evidence of crumbly dragonfly wings won’t do. If I am asked to believe in unicorns, being shown the pointy end of a narwhal tusk will not be enough. On the other hand, if we are to be persistently admonished by the demands of hagiography to give the late Jack Layton every credit for being the first politician of any standing in North America to pinch from, present as his own invention and heartily espouse a negotiations formula composed by Aghan crypto-fascists, Khomeinists, Arab League racketeers and the dodgier generals of the Pakistani ISI, then maybe we should be generous enough to just do it. Reasonable people may give the late Jack his due for such a distinction, but not everyone is going to go along with the fairy tale that there was anything progressive, innovative, made-in-Canada or “in keeping with Canadian values” about any of it. In the labour of competing with Talibs for the slippery loyalties of the gangland bosses who make up his Pashtun power base, Hamid Karzai has been relying on it as his preferred work-avoidance mechanism since 2004. Long before Layton and the NDP’s Paul Dewar put their licence plate on it, the Arab League’s Mokhtar Lamani, best known for securing a deal between the Organization of the Islamic Conference and the Christian rightists of the early Bush years to keep gay rights and birth control off the UN agenda, had nearly driven it into the ground. It’s been a make-work project and an agenda-filler for every big-turbaned Khomeinist imam and every lowbrow jackass warlord from Persepolis to Peshawar since September 11, 2001. The protesters who disrupted the Prom by the Israel Philharmonic and Zubin Mehta are not only guilty of cultural hooliganism, but are deeply misguided. As musicians, the Israel Philharmonic and Maestro Mehta are an apolitical ensemble; it is no way comparable to, say, a group from apartheid South Africa, because there is no barrier to members of any race or religion joining the orchestra. Although it would be an exaggeration to say that music and politics are completely separate, there is no way that the orchestra (or the Prom audience) should be made to suffer because of the political actions of their government. As a performing musician, I would find it deeply unfair were my concerts in any country to be disrupted because protesters objected to the British government’s decision to invade Iraq, for instance. I have played many times with the Israel Philharmonic orchestra, and have found them to be the warmest, most hospitable orchestra I know. Of course, there are a wide range of political opinions within the group, and their attitudes seldom coincide with those over here who condemn Israel, at a safe remove from any threat to their own lives; but on the whole, my friends in the orchestra (and elsewhere in Israel) are united by their desire to lead a peaceful life, their disgust at any disregard of human rights emanating from their own government or from any others in the region, and their belief in the two-state solution as the only possible way forward. To wreck their very rare and special concert over here gives a terrible impression of us all – haven’t the rioters done that already? Iran working on nuclear warheads??? The United Nations nuclear watchdog released a report Saturday stating that Iran is pursuing the development of nuclear weapons, adding that the Islamic Republic has upgraded its nuclear facilities in order to defend them from possible cyber attacks. According to the report by the International Atomic Energy Agency, Iran has installed new and improved 2IR as well as 4IR centrifuges, which according to experts, will be immune to cyber attacks that were able to breach the older centrifuges. The centrifuges have allegedly been installed, the report states, in a fortified underground facility for uranium enrichment near the city of Qom. Pro-Palestinian demonstrators inside the hall were greeted by boos when they tried to protest. Protesters have disrupted the Israel Philharmonic Orchestra's BBC Proms concert at London's Royal Albert Hall. Several demonstrators in the hall shouted as Zubin Mehta stood to conduct Bruch's violin concerto. Many other audience members booed in response. BBC Radio 3 said it had to interrupt its live broadcast twice "as a result of sustained audience disturbance". The Palestine Solidarity Campaign had earlier called on people to boycott the concert and urged the BBC to cancel it. In a statement published on its website ahead of the Proms, the pro-Palestinian group claimed the IPO showed "complicity in whitewashing Israel's persistent violations of international law and human rights". The BBC Proms Team tweeted: "We're sorry that the concert was taken off air following hall disturbance. Glad both pieces were heard by the audience in the RAH." It later added: "We regret that as a result of sustained audience disturbance tonight's concert was taken off BBC Radio 3." The performance, which consisted of four parts, was interrupted at about 19:45 BST and coverage was cut off again an hour later after more protests. A spokeswoman for BBC Proms said it appeared each piece had been targeted by different protesters seated around the hall. She said the broadcaster was "disappointed" the coverage had been taken off air but said the performance had continued in the hall. About 30 people were removed by security but there were no arrests and no violence, she said. The BBC's Tom Symonds said: "As Zubin Mehta stood up and began each piece a small group of protesters each time tried to stop the music. "They sang, they shouted, they were met by boos by the audience and they had to be removed by the security staff." Outside the concert hall a group of about 20 campaigners waved banners and sang songs in protest against the appearance of the Israel Philharmonic Orchestra (IPO). "Crime doesn't pay" is a nice saying. When it comes to diplomacy, however, it nearly always does pay. Without murderous terrorism, Yasser Arafat would not have led the Palestinian national movement to many of its achievements, including his successor Mahmoud Abbas' plan to ask the United Nations General Assembly to recognize Palestine as an independent state next month. Abbas has secured a majority in support of this, although not for UN membership, which must be authorized by the UN Security Council. Since Arafat first appeared on that platform, in 1974, his gun holster hanging from his belt, the Palestinians have advanced from being an organization (the Palestine Liberation Organization ) to an "authority" created by the Oslo Accords, and from there to being an embryonic state. Arafat leveraged Palestinian terror crudely - and directly. The terror attacks he masterminded eventually drove the Americans to offer him diplomatic recognition at the expense of its two veteran partners, Israel and Jordan. On the eve of UN recognition of Palestine, 18 years after the Oslo Accords carried Arafat to the White House and from there to the Nobel Peace Prize, and seven years after his death, the U.S. government now confirms that Arafat was responsible for the 1973 murder of its ambassador and his deputy in Khartoum, Sudan. The two were taken hostage and killed "with the full knowledge and by the personal authorization" of Arafat, according to a study released last month by the U.S. State Department's Office of the Historian, entitled "Foreign Relations of the United States, 1969-1976, Volume XXV, Arab-Israeli Crisis and War, 1973." The incident began on March 1, 1973, when eight members of Black September stormed the Saudi Arabian Embassy in Khartoum during a reception, and captured the Saudi ambassador and four of his guests: American ambassador Cleo Noel, U.S. deputy chief of mission George Curtis Moore, and the Belgian and Jordanian charge d'affaires in Sudan. Black September was a transparent front for Fatah, and Arafat was the commander of both, as well as head of the PLO. When the kidnappers understood that Jordan, Israel and the United States would not be releasing prisoners in exchange for the captives, Fatah headquarters in Beirut ordered them to shoot the two Americans and the Belgian, Guy Eid. Two months later - and one month after the so-called Spring of Youth raid on Beirut by an elite Israel Defense Forces unit, paratroopers and the Mossad, which killed three senior Palestinian leaders - Foreign Minister Abba Eban visited U.S. President Richard Nixon's National Security Adviser Henry Kissinger. "During the Khartoum incident, someone suggested we ask you for help," Kissinger said, according to the newly released report. "You would have blown up Beirut." Eban replied: "You know that it was from Beirut that the phone call went to finish them off." Kissinger concurred: "We know that." The official State Department archives do not contain information about intercepted communications between the Sudan terrorists and their handlers in Lebanon. For its part, the National Security Agency published its own documentation in the 1970s without any information concerning the Khartoum incident, which had been censored. At the end of the 1990s, a former navy officer named James Welsh launched a campaign to denounce the intelligence, security and diplomacy establishments' failure to warn about the Khartoum attack. In letters to Congress and interviews with the media, Welsh said that between 1970 and 1974, he had worked in the NSA and secretly monitored the Palestinians' actions. A day or two before the attack, the NSA recorded conversations about the terror plans, Welsh said, adding that he recognized the voice of Arafat telling his aides, Abu Jihad and Abu Iyad, to carry out the attack. The U.S. State Department was warned immediately, so it could pass on the message to the diplomats in Khartoum. When he heard about the attack in the media, Welsh was astounded to discover that the person on duty had decided on her own that the warning was not urgent, and thus had delayed disseminating it. It arrived in Khartoum after the murders. Welsh claimed that when he demanded that the State Department's failure be investigated, his superiors at the NSA told him such a campaign would cost him his security clearance and result in his transfer from Washington's quiet corridors to the rigors of a navy fueling ship. Welsh backed down. While there had been no official response to Welsh's claims about the negligence that led to the disaster (which resembled the communication glitches that led to the positioning of the U.S. Navy ship Liberty off the Israeli coast in 1967 ), in 2006 the State Department half-heartedly recognized the part involving Arafat. The NSA's top-secret report on the Khartoum attack was reclassified, although it was released without its original publication date, signature or the list of recipients. "The Khartoum operation was planned and carried out with the full knowledge and personal approval of Yasser Arafat," aided by representatives of Fatah in Khartoum, who transported the terrorists in their car, which enjoyed diplomatic immunity, the NSA report states. It makes no mention of U.S. governmental bodies, and it was included in a digitized collection of documents about Africa, published by the State Department's Office of the Historian, without an opinion as to its reliability. Furthermore, he claimed that because of the Israeli theft of water and the destruction of water wells and treatment plants, people realize that the two-state solution is rapidly fading. His libelous article, full of distortions, outright lies and false accusations, was yet another proof of the PA’s intransigence. First of all, article 40 (14) in the Oslo Accords clearly states that all JWC decisions about water projects in the West Bank need mutual agreement. Once approved, JWC projects for the territories under Palestinian control (Areas A and B) do not need any further Israeli involvement. Projects in Area C, where Israel is in control, need approval from the Israeli Civil Administration (ICA). Since 2000 the PWA submitted 76 requests for permits to the office of the Civil Administration. Subsequently 73 permits were issued by ICA and three denied because there was no master plan. Another 44 JWC-approved projects, the majority in Areas A and B, like the construction of a waste water treatment plant (WWTP) in Jenin that received approval in 2008 - have not been implemented. The German government even withdraw a plan to build a WWTP in Tulkarm when it concluded that the PWA could not handle the project. When, back in November 2009, the PWA complained about a lack of funds, the Israeli government offered to finance water projects for Palestinian communities. The PA has yet to respond to this offer. ‘Israel allocates only 10% of the shared water sources to the Palestinians’ claims Atilli. The water quota for the West Bank were mutually agreed upon in the Oslo Accords. As a result, 33% of the water in the aquifers under the West Bank is allocated to the Palestinians. In 1993 the Palestinians could pump up 117 million cubic meters and Israel would provide an additional 31 million. In 2007 200 million cubic meters were allocated to the PA, of which Israel provided 51.8 million. However, of those 200 million cubic meters, only 180 million were actually used. The main reason for this is that the PWA did not implement projects in the Eastern aquifer that would have solved much of the Palestinian water crisis. More than half of the wells approved for exploitation of the Eastern aquifer have still not been drilled. The permits were issued in 2000. In a letter written on April 4, 2001, the civil administration urged the PWA to execute these projects. A letter from June 8 2009 repeated that request. Atilli also lied about Palestinian water consumption. In the JPost article he claimed that Palestinians are ‘limited to an average of just 60 liters.’ However, in 2009 his own PWA published a report that mentioned an average supply of 110 liters per capita per day. Atilli’s level of chutzpa is best shown by his third claim, about Israel stealing water and destroying Palestinian water projects. In fact, Palestinians steal millions of cubic meters of water per year by drilling illegal holes into the water pipes of the Israeli water provider Mekorot. The Civil Authority fixes 600 of these illegal taps each year. Furthermore, since 2008 Israel has asked the PA to re-establish the joint JSET water patrols that fought water theft before the El Aksa intifada. Another reason for the loss of water is the poor maintenance of the Palestinian water infrastructure. A staggering 33% of the fresh water supply gets lost because of leaks, theft and poor maintenance. Other documents provided solid evidence that the closing of 250 illegal wells was agreed upon in the JWC meetings. For example, minutes of the JWC meeting on November 13, 2007 show a consensus decision to destroy ‘illegal drillings and connections.’ Nevertheless, Atilli acted as if he never attended these meetings or co-signed the joint decisions. He even had the gall to write urgent appeals to the international community as soon as ICA, after numerous appeals to the PWA to follow up on the agreed closure of illegal wells, finally closed those wells. These are only few examples of the shocking way the Palestinian Authority neglected the basic needs of its citizens and cynically uses water as a weapon in a PR campaign against Israel. It shows that, contrary to reports dealing with progress in state building, the PA is far from ready for statehood. There is, however, yet another conclusion to be drawn here. The stubborn refusal to work with Israel on mutual interests like improvement of the water infrastructure, and the way the PA subsequently uses that lack of improvement to demonize Israel, prove that the PA is not interested in the two-state solution, or peace.